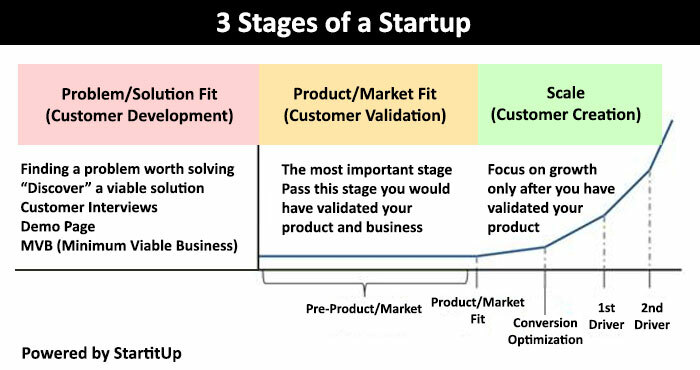 For every startup, you will go through those 3 stages: Problem/Solution Fit, Product/Market Fit, and Scale/Growth. Problem/Solution: This is the stage where you discover a valid solution for a problem worth solving for a sizable population. At this stage, it's important for you to interview users to see if you have made the right hypothesis on the problem and the solution. This is also a good time to learn about how you should build your product. PS: Minimum Viable Business (MVB) means that you deliver your solution manually without a product (Even an earlier version of your MVP) - reducing development time, money, and future failures. Product/Market Fit: The most important and difficult stage out of the 3 - if you are able to get pass this stage, then your product is pretty much set. You have left mission impossible land. This is the stage where you've built your solution into a product that people want and have validated your business model. Do not focus on getting users before you've achieved Product/Market Fit. Work with your early adopters and keep tweaking your solution until you are there. A good way to know whether or not you have reached this stage is if at least 40% of your users would be very disappointed if they could no longer use your product anymore. Scale/Growth: After you've validated your product is a fit for the market, launch it to the mass market. You can now begin to focus on getting new users, go viral (Growth Hacking + Content Marketing + SEO), etc. Continue to optimize each of your features to create a frictionless experience for your users. Build: After you have validated your problem and solution, your next step is to build your MVP (Minimum Viable Product). An MVP is a version of your product that only has the key features that are needed to solve the #1 problem of your target customers - and nothing more. For every key feature you create, you should define how each of them should perform (e.g. A key feature should make users read at least 5 pages upon their first sign-in). Your definition of how a key feature should perform would then be the benchmark of whether or not this feature delivers as expected. Measure: After the MVP is live and you have early adopters using the platform, you want to use tools to measure and get data on each of your key features. At this point you will find out whether or not a key feature passes or fails, and how users are using it so that you can tweak it. Learn: With that data you've acquired from the last step, you will have acquired validated learning, which will help you understand objectively and exactly what your users are thinking, and why some parts of your website are not performing. Armed with this data, you will go back to building and tweaking the features or sections that are not performing so that you can repeat the cycle again. 1. Lean doesn't mean you are frugal - It's called lean because the process helps you eliminate features that you don't need to build, which in result helps you build and validate faster. of course in the process of being crazily efficient, you save money in the process. The opposite of it is spending millions of dollars renting an office, hiring 10 engineers to build a solution that people don't need, and writing a business plan filled with assumptions. 2. 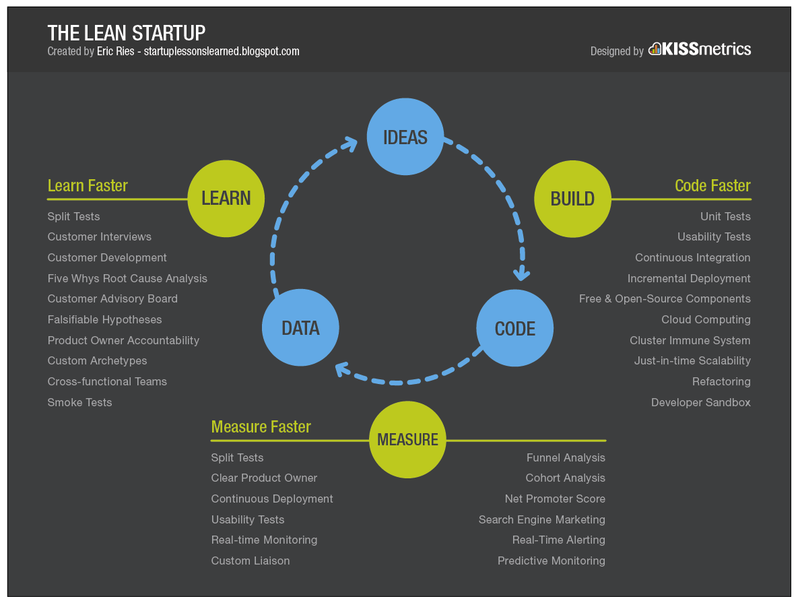 Lean isn't only for tech startups - Lean Startup Methodology is suitable for any size or any type of company. Lean Startup Methodology is about learning what customers want, and build that into a product with only the features that are needed to solve their problems. The opposite of this is building a product that you assume customers want, and features you assume customers need, which is what a lot of big/fat companies do. Therefore, lean startup is for everyone, every industry. The procedures are also not industry-specific, so that any company and follow the Lean Startup.